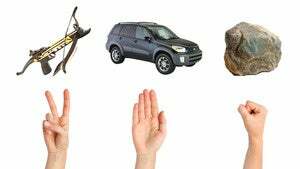 Street justice, extraordinary overkill edition: A boy throwing rocks at cars took a crossbow bolt to the belly yesterday, apparently as retribution for throwing a rock at a Toyota RAV4. The RAV4 had several passengers, one of whom literally went medieval on him, pulling out a crossbow and shooting the kid right then and there. Funny, I would have taken Goliath for more of a Chevrolet kind of guy. The injured child is being treated for "injuries that were not considered life threatening" at a Children's Hospital in San Diego.